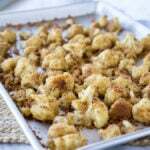 Parmesan Roasted Cauliflower is my newest baked veggie obsession! 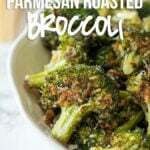 This simple side dish is so easy to make with virtually no clean-up! Not only is this a delicious vegetable side dish, but it can also double as a vegetarian chicken nugget! Winning! 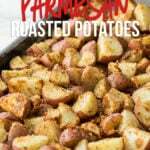 One of my favorite easy side dishes to make during the week are my Parmesan Roasted Potatoes. I am not kidding when I say that I make them at least 3 times a month. And that’s saying a lot for a food blogger, who has a high turn-over of recipe testing. 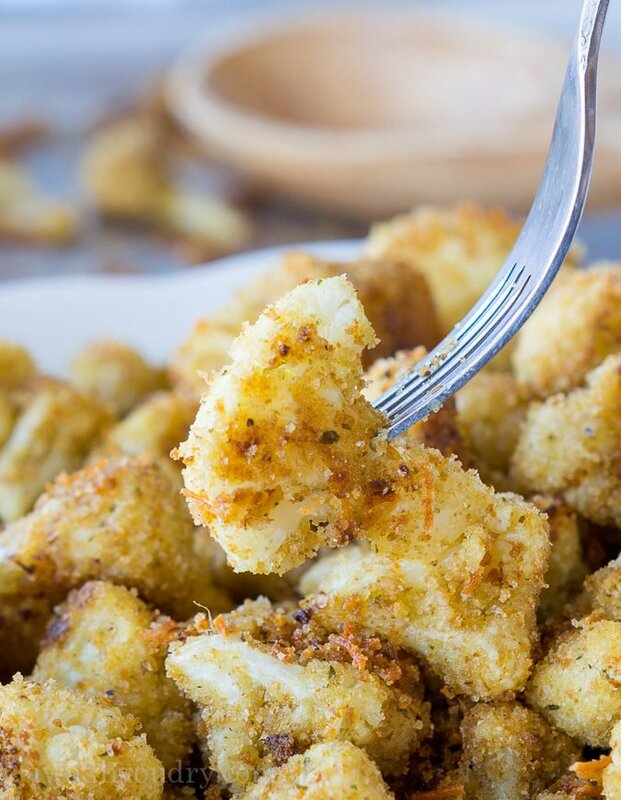 It hit me the other day that, if I like roasted cauliflower AND my parmesan roasted potatoes, why not try to make the same recipe, but with a little twist of cauliflower? I mean, less carbs on a weekday is never a bad thing, right? You guys – I made a whole head of cauliflower and between my and my 4 kids, we devoured every last bite. Here’s the best part – There are virtually no dishes to clean up! 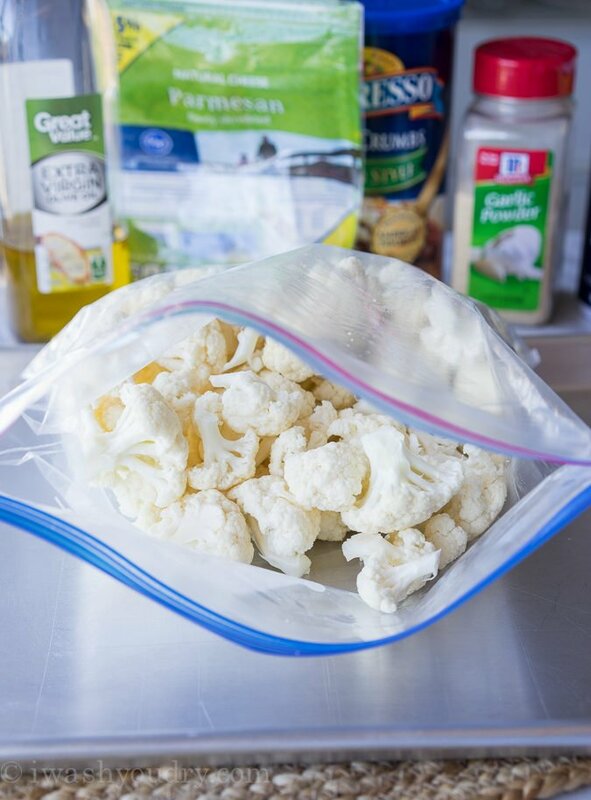 I place my cauliflower florets in a large zip close bag, add a little olive oil, toss to coat and then add the rest of the ingredients. Shake it all up and pour it onto a lightly greased, foil lined pan. Pop it in the oven and roast away! I can’t even tell you how much I LOVE this stuff. You’ll definitely want to add this recipe to your weekly rotation. 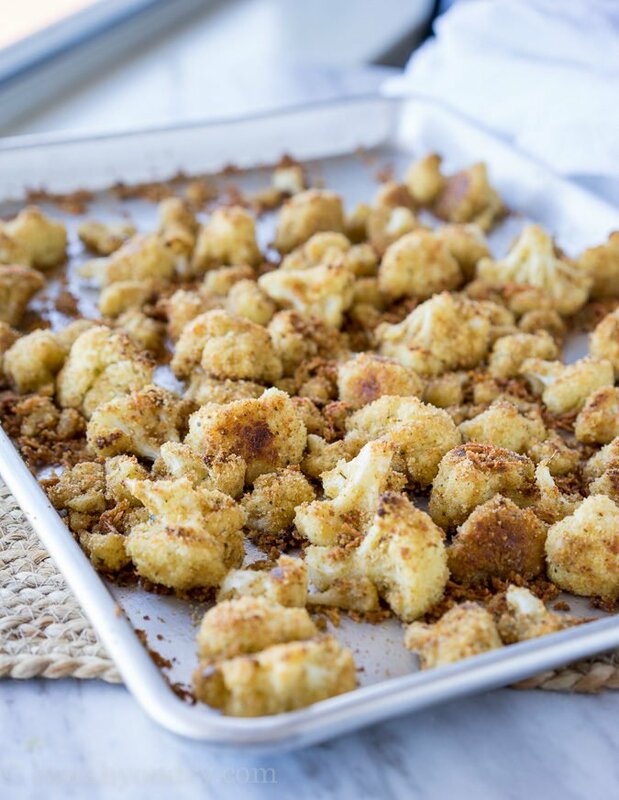 These Parmesan Roasted Cauliflower Bites are the perfect quick and easy side dish, or double as a vegetarian baked chicken nugget! Preheat oven to 425 degrees F. Line a large, rimmed baking sheet with foil and spray liberally with non-stick cooking spray. Set aside. Add the remaining ingredients to the bag and shake until coated, pressing slightly to help the breading stick. 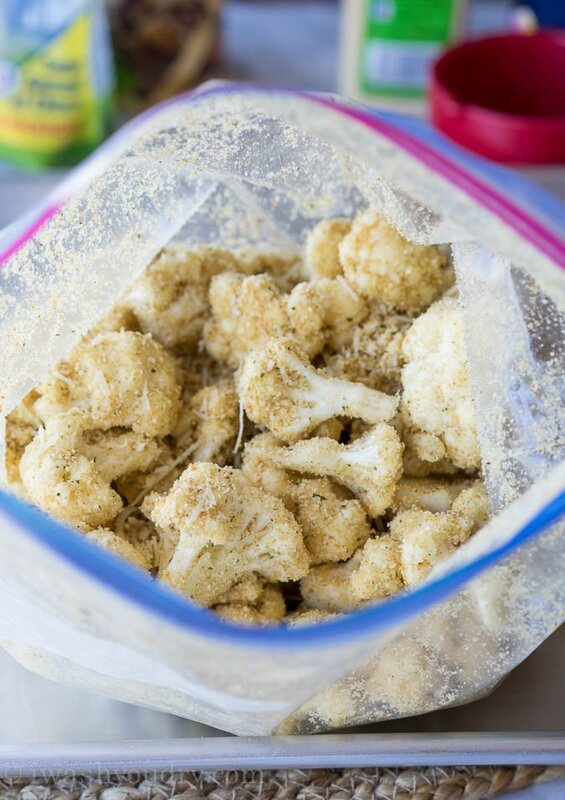 Pour onto the baking sheet and spray the tops of the cauliflower with cooking spray and bake for 20 minutes. Stir the cauliflower and continue to bake an additional 10 minutes. Serve hot. Enjoy! It’s in the oven now. Along with a chicken breast, using the same recipe. Can’t wait. Instead of using plastic why not do it the old fashion way and mix it in a bowl? Please, can someone put the carb intake with and without the panko breadcrumbs PLEASE ???? So if you’re eating the entire head of cauliflower made per the recipe, that’s 44 g of carbs. That is a lot of carbs if you’re on a low carb diet. I make it without the bread crumbs and it’s still delicious. Great! I’m happy you liked it. So don’t eat it. Or just eat a little of it. 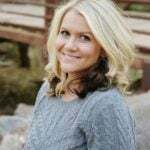 Goodness, if you’re on a lowcarb diet this might not be for you. 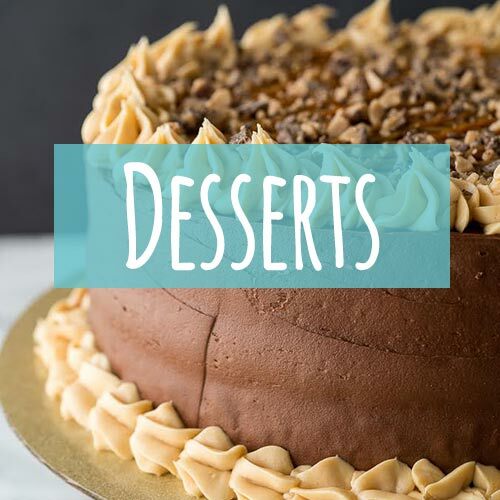 Looks VERY yummy! I’m trying it tonight. I didn‘t measure the cauliflower, just assumed that 7 cups of it could be one head. The rest stricltly per recipe. Thanks for the recipe, and greetings from Bavaria, Germany! 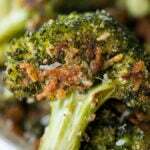 Could I use frozen cauliflower florets? 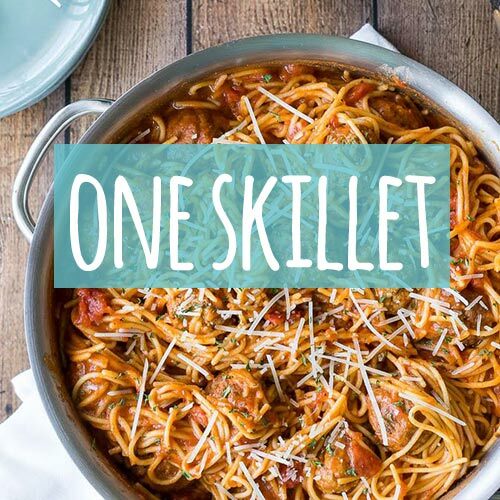 Do you know how many carbs and cholesterol this recipe has? I saw this on Facebook and was intrigued. We used to have cauliflower regularly but only steamed with parmesan cheese on, and to be honest it got kind of boring to me so we haven’t used it much, but we do make broccoli and Brussels sprouts often. If I wanted to do all three at once, would I need to adjust the recipe or cooking time? Absolutely AMAZING!!! I’ve made this several times and it’s gone in no time! Definitely a keeper and definitely want to try with Brussels sprouts! If you have any leftovers, serve them for breakfast warmed over with a poached egg on top. It sounds weird but it is delicious. If you want less carbs, don’t use the bread crumbs. Try almond flour of the coconut flour instead. Thank you. I was wondering what to use in place of bread. Wow! Needed to insert garbage politics in a recipe review? Incredible! Love your reply. Short and to the point. I find politics have taken an uglier place in our lives and was hoping to escape some of the American politics that you can’t seem to get away from right now. Your comments are spot on so thank you. Dadguy, this is a recipe site and not a political site. Shame on you for getting ugly! Maybe you are hangry so start cooking and feel better. he was joking. come on, guys. I am making for a family get together. Wow. I bet you think you’re funny. Can’t someone just post a recipe without this drivel? Dadguy was it really necessary to bring politics into a conversation about food? Please just let it be appetizing, not make us want to throw up. I’m using NPR tote bags, myself. Take your ignorant politics elsewhere. This is about food. Grow up. For those complaining about “single use” plastics, what os wrong with washing the bag and reusing it? I find that coating in the bag is a lot neater and more thorough than in a bowl. It’s really very sad in a sort of sick way when you are so vested in your political views that you have to force them off on the unsuspecting readers if a recipe site. I have fixed this 3 times for 2-4 people. I used 1 head as it came very close to 7 cups. 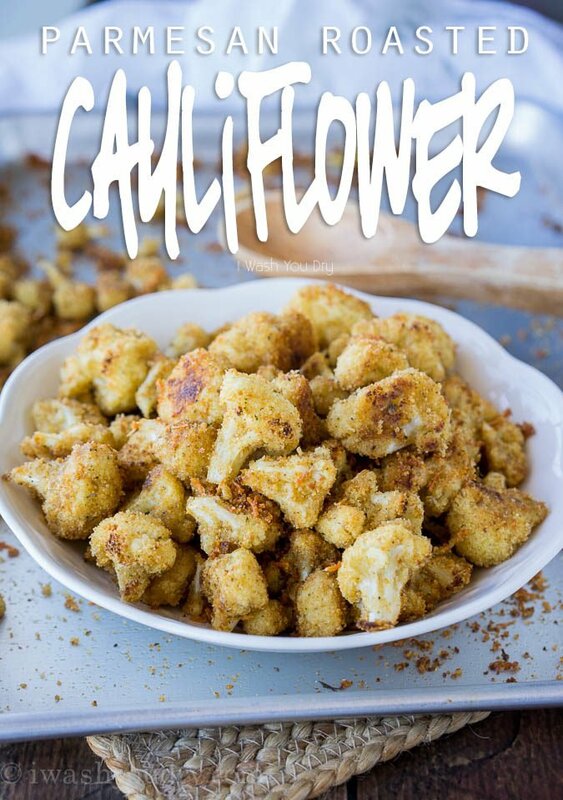 It is the best cauliflower recipe I have ever used. It is not hard at all. I made it tonight, and it was delicious. I only had about of a half a cup of panko, added some sliced zucchini in with it, and it was a hit. I was looking for good cauliflower recipes to substitute potatoes. My hubby is on a carb diet. I left out the breadcrumbs and made it with powdered and fresh Parmesan, added smoked paprika and pepper for color. Came out delish! What she means is a gallon size ziplock for mixing. Works great! Thanks was wondering how it would work with out bread crumbs. For those complaining about the plastic bag you could have just been nice and not said anything. You can use a bowl. Most people realize you can use a bowl in place of a bag! Btw the recipe is great! That’s not the point. Wasteful single use plastic is destroying the environment and it was totally unnecessary. I’m so glad to see so many people making this point, it gives hope for the future. And hopefully she thinks twice next time. I hope you do too. Are you really that short-sighted? Did you actually “see her” toss the bag or are you just “assuming”? We use ziploc bags all the time for just this type of mixing. It’s convenient, makes zero mess, is simpler (versus a bowl and spatula, etc) and we simply wash it out and put it back into the drawer so we can REUSE IT AGAIN. I’m not sure why you’d use a plastic bag to make this… (single use plastics?!) You could easily use a bowl, but since that I was shown I’m sure most will think they need to. Can this be done in an air fryer?